Step 1: Gently tug on the sides of the favor cup to undo some of the folds. If you undo all folds, the cup will be completely flat. I didn’t make all the cups identical – some are slightly more closed than others for subtle variation. Step 2: Paint the inside of the cups. First paint the interior walls (leaving the middle to hold onto) with a quick base coat, then with separate brushes add white and red streaks. Finally, paint the middle with the base color. Let dry. Step 3: Cut the crepe into fringe. If you’re doing lots of flowers as shown in the images, the best way to do this is to cut a 2 1/2″ chunk off the end of a roll of crepe paper. Unroll the chunk and fold it in half lengthwise, then fold it horizontally a few times and cut the fringe – I’m always surprised by how many layers of crepe I can cut through at once. Once it’s all fringed, cut into lengths 2 1/2″ long, keeping the pieces folded over. Step 4: Put a dab of glue in the center of the flower. Gather the crepe fringe so it looks like a starburst and place on the glue. Step 5: Rip pieces of tissue paper and crumple into small balls. Add another small dab of glue on the center of the red fringe and attach the paper ball here. Repeat! There are approximately 60 flowers in the images here – it took a few hours, but it’s the perfect mindless activity while binge-watching TV. 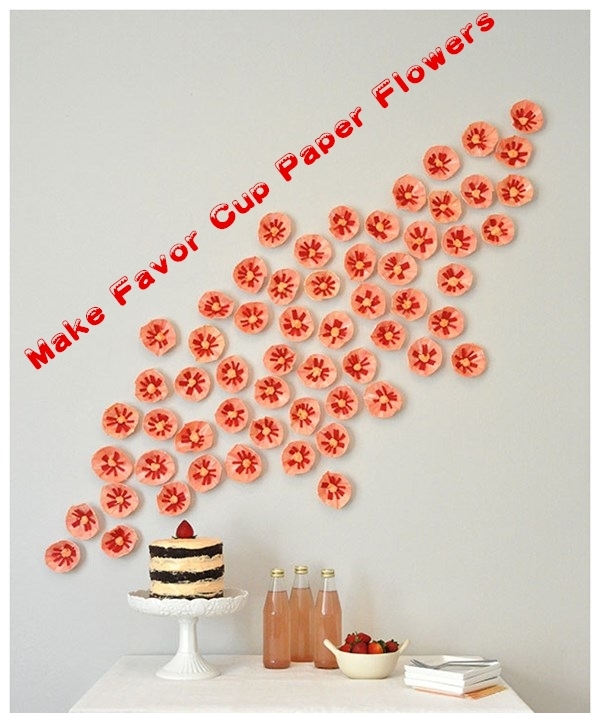 Use a rolled piece of washi tape to attach the center back of each flower to the wall.